This shampoo contains 1% pure Evening Primrose Oil which soothes and maintains dry sensitive skin. The special formula of this Coat Enhancer will help remove tear, saliva and urine stains from white coated breeds. 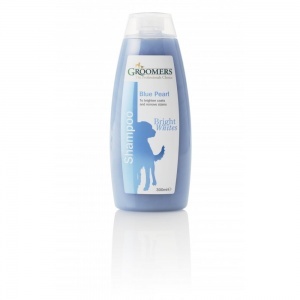 Evening Primrose Oil (EPO) is now used in all Groomers EPO shampoos to help soothe animal skin conditions. Originally commissioned by Cambridge Veterinary Sciences, Groomers have been manufacturing specially formulated EPO canine shampoos for over 20 years, becoming a land mark product. With very high levels of essential fatty acids, studies have shown that EPO has a significantly beneficial effect when used for allergy conditions, and dull coats with excessive moulting. Groomers Expert Tips: This is an ideal shampoo for dogs who suffer with yellow staining, especially after coming out of kennels. For best results do not dilute and allow the dog to stand in the product for a couple of minutes to absorb the oils. Rinse thoroughly and then dry in the normal manner.